"Lily Laskine taught me freedom." After 65 years, Marielle Nordmann, the great celebrated French harpist, can look back upon a glorious, adventurous and versatile career. She has played with many prominent orchestras and musicians on international podia and is also a Professor at the Paris Conservatory. Nordmann started playing the piano at 6, but when she was 10 her grandmother - also a harpist - persudaded her to go and visit the "Grande Dame" of the French harp society, Lily Laskine, who by that time was 60. 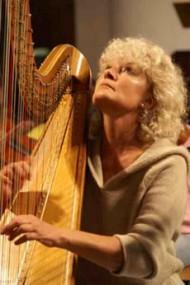 Marielle Nordmann had had only 3 months' experience of playing the harp before meeting with Lily Laskine, who subsequently taught Marielle the harp for a number of years at the Paris Conservatory; however, Laskine, one of the greatest artistic personalities of the 20th century, became more than a teacher to Marielle: she became her mentor, friend, and musical partner, someone with whom she would perform for over 10 years. Marielle stayed in touch with Laskine until her death in 1988. "Lily Laskine taught me freedom," Marielle says. "She taught me freedom of thoughts and heart. She was an incredible, extraordinary personality." "It is not possible to play the same repertoire all your life." Marielle Nordmann played with some 100 different orchestras around the globe, and the course of her long career has reached the abolute summit in the harp world. She smiles and with a good sense of humor says, "I am in fact the highest harpist in the world because I have climbed to a height of around 4,500 metres in Bhutan, at the eastern end of the Himalayas, and that's something I am very proud of." Nordmann, the only international artist to have played in Tierra del Fuego, has an irresistible urge to experiment and in recent years has played more and more often with a variety of different instrumentalists such as the Argentinian bandoleon player Eduardo Garcia and the former Serbian violinist Nemanja Radulovic. She was also charmed by an exciting "liaison" with the French tap dancer Fabien Ruiz, the choreographer of the film "The Artist". Nordmann: "We did a concert together. I played the harp and he was tap dancing to my music. It was Spanish music from South America. It was beautiful, because you know, the rhythm of a tap dancer is so interesting for a harpist." Earlier in het career she performed together for 10 years with the famous French harpist Lily Laskine, from whom she received a harp lesson on her 10th birthday. But in recent years, a fresh wind has been blowing. Marielle Nordmann, founder of the 'Concours Internationale de harpe Lily Laskine' in Paris, of which she will once again take over as artistic director in 2017 after an absence of 5 years, is passionately courting other instruments. "It is not possible to play the same repertoire all your life. It is just not possible, and you know, I am such a free woman that I like to experiment, I want to get new experiences and to transcend my own borders, to break down the frontiers of human life. I want to try to open all the windows and all the doors of music, not only for me, but also for generations to come. We always need to open new doors and windows." “The harp and bandoleon playing together is like flying to the moon for the first time." Marielle Nordmann is currently very enthusiastic about the combination of the harp and the bandoleon. "I met the bandoleon player Eduardo Garcia, 3 or 4 days, in France, He is from Argentina, but has lived in France for about 25 years now, I think. He phoned me one morning and said: "Mrs Nordmann, I love your music, would you like to make some music with me? I knew a little about the bandoleon because I have performed in Argentina and I heard a lot of bandoleon music while I was playing there with tango orchestras. It has always been very difficult for me to play tango music on the harp, but it was very exciting to play with him. It was as if I was a beginner in music. I have been playing with him for 3 years now. We have performed together in France and Argentina and in other countries such as Thailand, Brazil and Isreal. We travelled a lot together and when we play it is always with a feeling of happiness. When he first asked me to play with him, I could also have said no, because some people might think it odd to combine the harp with the bandoleon. But I am a pioneer, so I tried it and it has been a fantastic new combination of sound and rhythm. It is the same thing as when the first man went to the moon.!" The Serbian violinist Nemanja Radulovic, a naturalised Frenchman for a number of years, and Nordmann form a harmonious duo that play together flawlessly. The violin and the harp form a wonderful combination. Together Nordmann and Radulovic released the CD "Après un Rêve" and have performed together both in and outside France. They have played a variety of works including "Fantaisie pour violon et harpe" by Camille Saint-Saëns (see the video clip above) and works by Tchaikovsky, Dvořák and Copin, as well as "Danses populaires roumaines" by Béla Bartók. Marielle Nordmann talks almost poetically about her synerghy with Radulovic, the young, artistic violinist of the new generation. Nordmann enthuses: "I think Fantaisie pour violon et harpe is a very beautiful piece. Although the playing together of two artists is the most important thing, the way the two instruments combine is also really important. The sounds of the violin and harp form a natural combination, because the violin is like the human voice and the harp is there to take the violin in its arms and help the voice of the violin to sound as beautiful as possible. I think two instruments are not just there to make music, the sound of one instrument goes directly to the heart of the other. "Nemanjua Radulovic is one of the great artists alive now," Marielle continues, "because he has such a big heart and is so open. He is only 29 years old but he is a very special artist, not only for France but everywhere, because he plays everywhere on the planet. He is from the new generation. I have been playing with him for many years , because he was only 13 when he arrived in France. So I have played with him for almost 16 years. He is an immense artist. When we play together, there is a kind of connection between us. I don't know exactly how, but it is just happiness for us, and I think also for the audience. I have a very strong relationship with this boy, who is even younger than my son. When playing with Radulovic, there is no age difference. It is a human meeting, we really love to be together." Marielle Nordmann can first and foremost be classified as a social harpist. She does a lot for charitable projects, like in Haiti. In October 2014, she perfomed there with bandoleon player Eduardo Garcia in a special concert for children for the Enfants Soleil organisation. Enfants Soleil sponsors about 240 children and Marielle Nordmann finances the education of a number of children. Nordmann is also the founder and Artistic Director of the Festival "Les Musicales" in the parc of l'Orangerie de Bagatelle in Paris, an organisation that has been in existence for some 8 years now. Marielle: "This festival is for very young, gifted musicians, not only harpists, but all kinds of musicians. The Foundation Les Musicales helps young and handicapped musicians and gives them a chance to develop. "It is a good organisation that helps people. We give concerts in a beautiful garden in Paris to sponsor them." In addition, she gives concerts for the humanitarian organisation "Coup de Pouce", based in Paris, that carries out various activities including building houses, schools and hospitals. "I give concerts there to help them to do what they have to do. It is a humanitarian organisation. They are building everywhere in the world, it is a fantastic organisation." "The Argentinian people have stolen my heart"
An important guiding principle in her career is the link with South America, and in particular Argentina where she lived for 3 weeks every year from 1989 to 1999 to give concerts. The Argentinian land and its public have stolen her heart. "I went to Argentina for 10 years and I performed there and taught the harp and gave master classes. I originally went there because I was invited by the French Ministry of Foreign Affairs. They asked me to go because they needed teachers in Argentina." "The grandmother of Argentinian students"
It was a fascinating period, because Argentina is a beautiful country and I love the Argentinian people. The audience in Argentina is always incredibly warm and I am also now an kind of grandmother to all my Argentinian students. In Argentina I played with some great Argentinian musicians, violinists, flutists and othe musicians. I also played with the Buenos Aires Philharmonic Orchestra."